Grocery shopping while hungry – oh boy. It seems to happen all too often, despite my best intentions. Sometimes, simply being in the proximity of tasty looking food makes me hungry. Ok, make that always. Last week, Eric and I were picking up some groceries at Whole Foods around dinnertime. Shopping at Whole Foods before dinnertime is Trouble with a capital T. I’m out of control and totally irrational. The hubby made a beeline for the pizza and I contemplated buying food from the hot and cold bar. That is, until I spotted a row of glorious, vegan, made-from-scratch soups on the very top row of the cooler section. The angels started to sing!!! Moral of the story: ALWAYS look on the top or bottom row at Whole Foods! That’s where the hidden gems are. I was suddenly struck by an intense craving for broccoli and “cheese” soup. Funny how that happens! The jar was thrown into my cart so fast my head almost spun. Needless to say, I polished off the jar by lunch the next day. SO GOOD. My new obsession was either going to make me broke feeding it, or I was going to try and make something similar in my own home. I bet you can take a wild guess what I did. That’s right. I got down and dirty in the kitchen. Recreating favourite store-bought foods is a true passion of mine. My version is a bit thicker than the original, but I’m not complaining. The original soup might be a bit stronger on the broccoli too, while mine probably has more squash and sweet potato. Either way, both are crazy good. It made a whopping 10 cups worth, which is so great for leftovers all week long! Silky smooth and bursting with 7 healthy vegetables, this soup will keep you feeling great all fall and winter long! 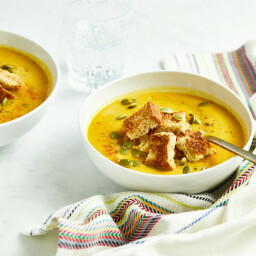 The nutritional yeast gives this soup a "cheese-like" flavour and simple spices allow the flavours of the vegetables to shine. The beauty of making a puréed soup is that you don't have to fuss over chopping the vegetables with great precision since they’ll be blended anyways; this results in a faster prep. To give the soup some texture, try topping it with my easy Pan-Fried Garlic Croutons and toasted pepita seeds. Grab a very large pot (about 6 1/2 quarts) with a lid and set aside. Add the onion and garlic with the oil into the pot and sauté over medium heat for a few minutes. Season with a couple pinches of salt and pepper. Add the celery, carrots, broccoli, sweet potato, and squash, one by one, as you chop them. Continue to sauté over medium heat, stirring every once and a while so it doesn't stick to the bottom. Cover the pot with a lid and cook the vegetables for 4 to 5 minutes, reducing heat if necessary. Remove lid and stir in the broth. Bring the soup to a low boil. Reduce heat to low/medium and cover with lid. Simmer for 10 to 15 minutes, until the squash and potato are fork tender. Turn off heat and remove lid. Allow the soup to cool slightly for 5 minutes or so. After cooling, carefully scoop the soup into a blender (you'll have to do this in a couple batches most likely) and add in the nutritional yeast and optional cayenne, if using. Carefully blend the mixture with the lid ajar (to allow heat to escape), starting at a low speed and increasing the speed until smooth. Season with salt and pepper, to taste. Alternatively, you can use an immersion blender. Pour all of the puréed soup back into the original pot. Now, stir in the vinegar or lemon juice, to taste, about 1 teaspoon at a time. I usually add between 1 to 2 teaspoons of white wine vinegar. This helps give the soup flavours some brightness. Ladle into bowls. Garnish with toasted pepita seeds and croutons. Transfer leftovers into jars and allow to cool before securing the lid and placing in the fridge. The soup should stay fresh for a week in the fridge. To freeze, add cooled soup into a container or glass jar, leaving 1 inch at the top for expansion. Secure lid and freeze for up to 1 to 2 months. Nutritional info uses 1 teaspoon fine sea salt. 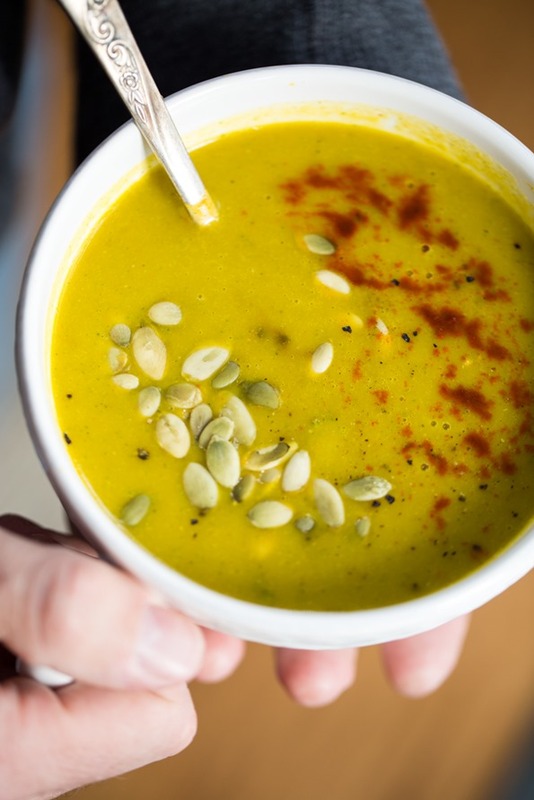 * The delicata squash in this soup is totally optional. It still turns out lovely without it. 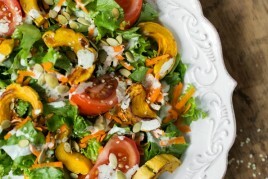 Or you can also try swapping the delicata squash for peeled and chopped butternut squash. 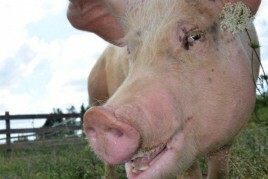 By the way, a huge thank you to everyone who made a donation to TEAM MOO in Farm Sanctuary’s What Did U Do? campaign! We’ve raised over $1000 (and a total of $3341 on our team!) and I can’t thank you enough for your generosity. This is going to help so many animals get the care they need. The campaign runs until October 2nd so you can donate at any time. To find out more, see yesterday’s post. YUM!! This soup is amazing! I tried it last night for the first time and it is now in my recipe box! I will be making a full batch next time so I can freeze it! Thanks! Exactly! Though, I cannot control myself in Whole Foods either which way, hungry or not, so this is why I’m so glad our Whole Foods is about a 30 minute drive from where I live. I don’t make it there very often, & my husband is happy about that :). I have a question about the soup–do you taste the cinnamon at all? I threw some cinnamon into a pumpkin dish the other day (that was savory, not sweet) & was thrown off a little. I realized I don’t really like if I can taste cinnamon in a savory dish. I too love recreating less expensive versions of my faves (mostly restaurant food for my husband, since we’re on a tight budget). It’s always fun when you’re version tastes better than the store-bought/restaurant! Yes you can taste the cinnamon for sure – if you aren’t a fan you can leave it out or swap it for another spice. Hope this helps! I was wondering if there was any way cut out some of the cooking time on the stove and use the wonderful Vitamix to heat up and cook some of this soup. Maybe if you don’t mind pulverized raw vegetables?? I don’t know. Either way it looks yummy! I just took a soup class from a restaurant owner/chef. He made his soups just like you did by cooking them first. Only he didn’t crack the lid on his Vitamix, he strained after blending and added a bit of heavy cream once it was back in the pot. I don’t think it’d come out very good by using raw veggies. And the Vitamix is only a blender and doesn’t “heat up and cook”. Can’t wait to try your recipe! Actually, the Vitamix does heat up. I have hot soup within 5-6 minutes with mine..
I’m planning to make it in my pressure cooker. If time is your concern, you may want to look into one. I make butternut squash soup in my vitamix ALL THE TIME :) So wonderful! It actually does heat up the soup. I cook all the ingredients down first on the stove (onions, squash, etc), then add to my vitamix with some broth, put the lid on & take the center part of the lid out & put a kitchen towel over that. It’s such a wonderful invention, that Vitamix of mine! Actually, Vitamix has a number of soup recipes that you can make by just throwing all the ingredients in and blending. It does heat up if you let it run for a few minutes which is how you can make things like scrambled eggs right in the blender (I don’t know why you would, but it’s possible). Actually, the Vitamix is definitely not “only a blender”. I usually make and heat my soups all in the Vitamix. No need to cook the veggies first unless you want to. They will be pulverized and all that wonderful nutrition hiding in the plant cells bursts forth with all the natural flavor intact. You don’t destroy the plant enzymes by cooking the veggies. Just let the Vitamix run for 4-5 minutes and it will be piping hot (steam actually comes out of the container when you remove the lid). Every last bit of nutrition remains in the soup. 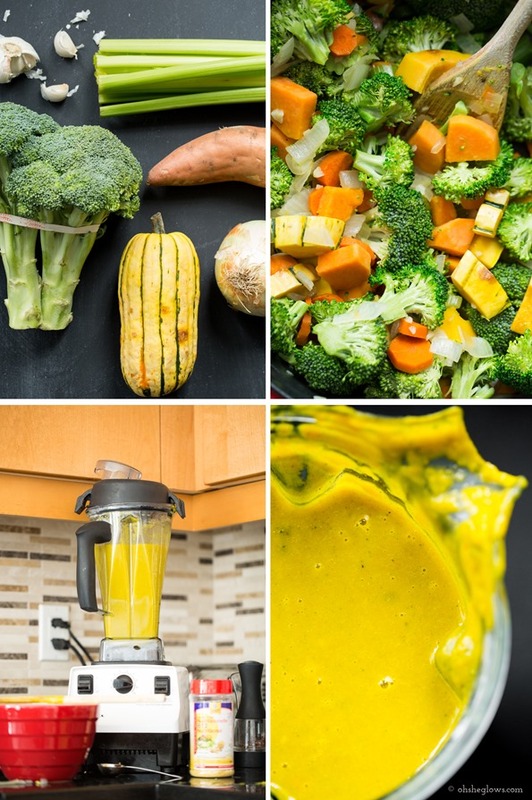 The chef you took the soup class from could use a brush-up on the marvelous uses of the Vitamix! Now you know more than he does! Maybe you should give the next class! If you have a Vitamix, you should give this a try. But please, don’t ever call it “only a blender”. I have made this soup a few times with the delacata squash. I have a butternut that I just chopped up to use this time. Do I need to cook the squash before putting in the blender? I recently received a Blendtec. I prefer raw. So, I’d rather put it all in the blender and not have to. I have not yet tried my Vitamix to make soup, but it definitely fully cooks and makes hot soup (and then you can also do ice cream-or a non-dairy frozen treat- in it, how crazy is that??) I got mine from QVC and they demo hot soups all the time. It’s the high speed and length of time that creates steaming hot soups. They demo a cream of broccoli in like 5 to 8 minutes. Unreal!! Yum! I know what I’m making as soon as I get a new thing of nooch! Also, that little cut-work saucer is simply stunning, where is it from? Thanks Robin! I think it’s from Pier 1. Yummy – already planned parsnip and ‘cheese’ soup for dinner tonight. And hoping I can find one of those squashes at the Farmer’s market this week! I love soups packed with veggies, especially since I’ve been lacking in the veggie department lately. I bet the nooch adds the perfect cheesiness to this yummy fall soup. Thanks for sharing! Squash soup is always a fall favorite but I’ve never incorporated the celery and broccoli before! More green vegetables is always a win. And storing the vibrant yellow soup in the mason jars is so pretty! I adore soups like this! I doesn’t feel vegetable-y but is so so good! Really? That’s strange! I haven’t heard of this issue before. What web browser are you using? Oh boy! I had the same issues at whole foods the other day, I think I am going to pack snacks before I go to the grocery store. I love the color and how there are leftovers for those days you just don’t want to cook. I LOVE making soup. I especially love making soup that goes into a blender (I use an immersion blender instead of having to transfer it). This soup is definitely going on to my list of recipes to try. I even have nutritional yeast and have been looking for good ways to use it. 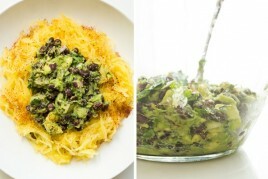 I am newish to the plant-based lifestyle and love finding recipes like this. Thanks! Whole Foods is dangerous for me no matter when I ate last. Everything always looks amazing! I’ll have to remember your tip to look on the top or bottom row. This soup looks unbelievable! I am so glad you decided to recreate it because I’m not sure they sell that brand at my local WF store. I can’t wait to try it! Do you have a nutrional breakdown for the soup i.e. Calories, protein, carbs etc. No I’m sorry I don’t! calorie Count is a free site that I’ve used in the past for blog recipes and it works quite well. I’m so happy it’s finally soup weather around here! This is definitely happening in my kitchen tonight! What is nutritional yeast? Do I need it in the recipe, and if so, what does it do? Thanks!! I’m wondering the same thing and where do I find it in the store? It is a powder… Organic section, probably with the flours and such. It is a yellow color. It gives it the ‘cheesy’ taste without the dairy. What is delicata squash? And can you substitute a different squash. I don’t think I’ve seen that at my local stores. A soup puree is my all time favorite. What a great recipe to start the fall season! I haven’t tried nutritional yeast, but it is definitely on my list! I heart this soup even though I haven’t tried it yet… the color itself is a wonder! Oh yum! I love soup so much, it’s a very comforting meal. My husband, on the other hand, is not a fan so I rarely make it at home :( But I definitely want to try this! I love soup–and it’s cold and windy here this morning so I am REALLY starting to get it on the brain. Now I’ll have to pick up some delicata and broccoli next time I go shopping! I feel warm and cozy just looking at this soup. I will be creating asap. Also, delicata is my absolute FAV squash. Can’t wait. Are there any substitutes you would suggest for the delicata squash? I’ve never seen that variety at my local supermarket. Congrats on the fundraising Ange! That’s awesome! I totally agree – grocery shopping (ESPECIALLY at Whole Foods) while hungry is super dangerous! This soup sounds amazing! I’ve been totally in the mood for warmer fall foods these days, especially squash. Recreating restaurant/store bought foods is one of my favourite little cooking challenges – it’s so satisfying, especially when your own version turns out better! On Monday night I was dying for some broccoli & cheddar soup! I’m so glad I didn’t succumb to the take out variety when I can make this for myself. Awesome looking recipe and congrats on the great results for your fundraising!!! And oh my goodness shopping when hungry is DANGEROUS! Especially somewhere where even on a full stomach you want to buy everything. Making huge batches of soup to freeze in smaller portions is one of my favorite kitchen timesavers! It’s a lot easier not to go buy lunch when you can just pop a container of frozen soup on the stove. I love how packed with veggies this soup is–so great! This looks amazing! I think my mom and I are both going to make it tonight :) Do you think it would work in a crockpot? Yup, I’m definitely guilty of going grocery shopping while hungry around dinner time. If I really can’t stand it, I’ll buy myself something quick and cheap to deal with it (e.g. a fruit strip, a granola bar). I’d been wondering about making a cheezy vegan soup (a vegan version of beer cheese soup, maybe), and this one looks really good! Thanks for the recipe. What a great inclusion of all those vegetables! I’m a big fan of broccoli cheddar soup, and this really seems like a recipe that I’ll need to try out. And hidden gems on the top/bottom shelves of the store – love those. It’s the buried treasure finds that I usually love the most! I think a variety of squash would work, so I can’t see why not. Maybe try adding a little bit at a time and taste as you go? This looks so yummy! I have always loved cheddar broccoli soup (it was a staple in my family growing up). With the weather that UT has been having, I am really wanting a warm bowl of soup and I think this one will do the trick. Sounds delicious!! Just right for a perfect autumn day. Thank you so much for this recipe. We were just talking about making some soups as the temps are finally below 100 here. Maybe in a couple more weeks, it will be cooler…like in the 80’s and we can make this! It looks awesome!! Can’t wait to try this recipe!! !i’m in hungary now but when i come back in 2 weeks, this is what i’m gonna cook!!! I have seriously bookmarked the last 4 or 5 recipes you’ve posted! I love that you are posting so often this month! Just discovered the word “hangry” last week and laughed so hard because I TOOOTALLY get hangry between meals if I’m not snacking. Glad I’m not alone :) Also? Soup looks delicious. That looks delicious and such a great way to welcome fall. I’m the same way when it comes to foods I love – I find a way to recreate it at home. Thanks. This looks fabulous. It’s on the menu for tonight. To really save money on vegetable stock, here’s a simple and free way to do it. Get a large ziplock freezer bag. Throw all your veggie scraps in it – ends of carrots & peels, potato peels, broccoli stems, asparagus stems, onions & peels, spinach, mushroom stems, etc (skip lettuce, cabbage or anything really strong). When you need stock, fill a pot with water (however much stock you need), add a handful of frozen scraps (grab a mixture) and a little salt (optional). Bring to a boil and reduce heat to a simmer. Simmer for 5-20 minutes (no longer than that or it can start to go bitter). Strain and voila, free stock. The longer you simmer, the strong it’ll be, but even 5 minute stock is more flavourful than water. Making your own is free and it lets you control the salt, which is especially good if you’re going to use it for beans or lentils since you don’t want salt until later in the cooking process anyway. *Note: the green stems, broccoli, asparagus and mushrooms will make it a dark stock. For a light stock, just grab onion and carrot bits. this looks so yummy & it’s a great recipe going into fall! will have to try! Broccoli cheese soup is one of my favorite soups. Soup is one reason I love fall, I’ve made soup every Sunday for the past 3 weeks! I can’t wait to try this recipe, I love your other broccoli soup recipe so am confident this one will be great as well. This soup sounds lovely, and so simple! I bought a delicata squash yesterday and I think it’s meant for this soup. Hi! We don’t have much squash here in Australia, but we do have a couple of different types of pumpkins. Could I substitute with pumpkin? WE’VE BEEN GETTING SO MANY WONDERFUL OSG RECIPES!!! It’s like Christmas over and over again! I love it. So many great ideas, all delicious and diverse! hahah this comment just made my day – thanks so much! I’ll think of you when I’m losing my mojo. Saw this recipe first thing this morning, dreamt about it all day, and now I’m eating it for dinner! Bonus: made the entire soup out of CSA veggies! However allergic to broccoli…. What can I substitute that would work with all the flavones? 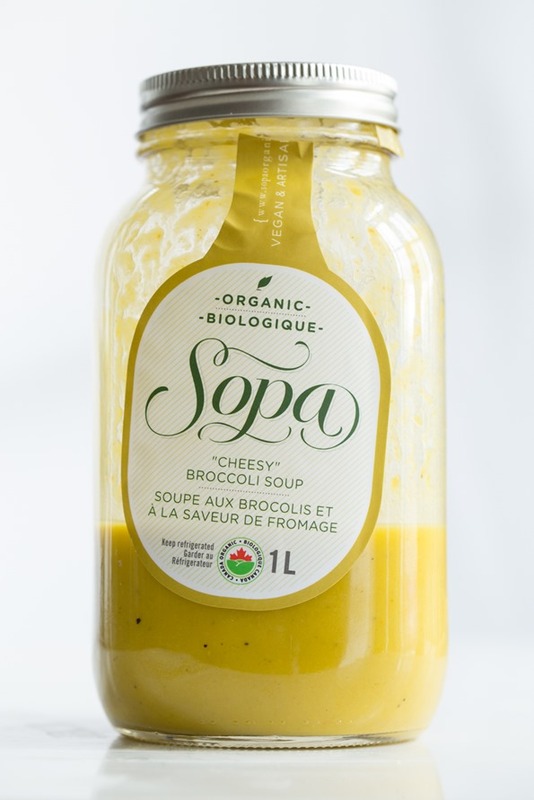 We sell Sopa soups at the cafe I work at in Etobicoke (it’s called Birds and Beans). My favourite kinds are the Curried Cauliflower (which I plan on recreating) and the Lentil Lime. So good! I have yet to try this variety, but now I can with this recipe! I saw your post during my lunch break and had to make this for dinner! Turned out sooo good, perfect end to a rainy day. I had to sub zucchini for the squash, red potato for sweet, and use my hand blender, which actually produced a super smooth texture. Another great recipe! Hey Melissa, So glad it worked out even with the subs! Don’t you love when soup recipes are versatile? Thanks for letting me know! Hi! I know this is supposed to be a “cheesy” soup, but would it taste good even without the nutritional yeast? Thanks! I’m not sure…I forgot to try it before I added in the seasonings! The seven vegetables and the cheese in your soup makes it mouth-watering! I will try your recipe soon. Thank you. This soup sounds perfect for Fall/Winter! Two quick questions- what brand of vegetable broth powder do you use? Also, could I use an immersion blender instead of having to transfer the soup to a blender? Thanks for the info! Angela, you have no idea how many lives are being positively influenced and changed by what you do in your kitchen and here on your blog. I, being one of them, want to thank you from my heart and let you know you’re loved and admired very much! Keep being who you are, and doing what you do! You are so sweet, thank you so much for your lovely words! I appreciate you so much. PERFECT. I need something tasty that I can freeze for late nights when I come home around dinner time absolutely starving. Would you recommend freezing glass jars? I’ve never tried it before and am a bit scared that might now work, but I don’t have a lot of other containers I could use. I am currently fighting a nasty cold and want to make this tomorrow.. I only have one package of (frozen) broccoli and two bags of (frozen) cauliflower. What would you do? Do you think it would be good with cauliflower? Now THAT looks awesome! Do you think you could substitute regular potatoes for the sweet potatoes? This recipe looks so wonderful! If I were to sub an acorn squash, would I have to bake it beforehand? Thank you! I would just follow the cooking method as described..should be fine! Soup is a recent passion of mine and THIS will top the charts. Oh my gosh, it sounds and look so good. Our weather has been in the 70’s so it is perfect weather for soup! I can’t wait to try this. You do have the MOST amazing recipes on here! Oh my I am craving this soup now even though its spring here is Australia and not really soup season. I might just whip up a batch! I made this last night for dinner. I admit, I was afraid… I don’t like squash soup or any sweet soups. But I followed the recipe to a T and it was DELISH! The hubby loved it. I used a cup of it, some cooked quinoa, bread crumbs and made ‘quinoa veggie balls’ for the toddler. He loved it too! Made this last night, so, so, SO good. My husband said it was one of his fave soups ever. I’m making more to freeze today. Omg!! I made this last night and just ate it for lunch! SO SO DELICIOUS!!! Hey Patti, So glad you enjoyed it! :) Thanks for letting me know. I made this the other night, adding in some parsnip and garnet yams, and substituting acorn squash for delicata, which I could not find in my local grocery store. Absolutely delicious! My SO threatened to eat it for every meal until it was gone, and I’m traveling today and actually worried that there won’t be any left when I get home, or that I’ll find him mainlining it. That’s a lot of mental energy invested in a soup, but deservedly so. Thanks for the great recipe! Thanks for sharing this recipe! I want October to be full of soups so I will definitely be making this. I plan on steaming frozen broccoli as I’ve heard boiling broccoli causes a loss in nutrients. Perfect timing for posting a soup recipe as the weather here just turned cold and foggy. I made this soup for dinner last night as I was in need of a heavy dose of veggies. This soup definitely did the trick. I love how packed it is with nutrient dense seasonal vegetables. Just what I needed. I didn’t add the cinnamon, since I like my soups more savory, and it was delicious. I also added some cooked quinoa to the soup to give it a little protein.By the way, I bought an immersion blender for $10, and it cuts WAY down on the prep time. Now I have a ton of soup ready to freeze for quick, healthy lunches this season. Thanks for the great recipe! this soup was delicious – I couldn’t find the type of squash listed in the recipe – i did find one called a “sweet potato squash” but wasn’t sure if it was right so i didn’t buy it. now looking on line i see that delicata and sweet potato squash are the same thing :) anyway the soup was great without it! thanks for the recipe. My sister has been in town and we were planning a bit fall feast for her last night with us here. As soon as we saw this recipe, we ran to the market and picked up all of the ingredients. Angela, this soup is inspiring and heart-warming. We simply could not wait for it to cool last night, so we ate it in its heartier, chunkier form. Then, we blended it so that we could have the smoother version today for lunch! This soup is criminally simple and moan-inducing delicious! It will definitely be a cool-weather staple around here! This looks very yummy. I will definitely be testing it out! Thanks. Hi Angela! So I’ve been reading your blog for a while now, but I’ve never commented before. I am not a vegan, but I do believe in eating lots of fresh produce and I absolutely LOVE all of your recipes. They’re always so vibrant and full of good for you ingredients! Just made this soup for dinner tonight, it’s delicious! I pretty much made it as written, except that I didn’t have any nutritional yeast on hand. So instead, I whipped up a small batch of cashew cheese with about a 1/2 cup of cashews, 1/2 cup water, garlic powder, onion powder, and paprika. I blended it in with the soup and it turned out great! Hi. Making this later. Do we keep skin on the delicata squash as it appears in pic?? I made some delicata yesterday. Didn’t know if I could use the cooked squash!! Thanks!! Yes you keep the skin on :) enjoy! Question: what type of nutritional yeast do you use? I have two types in my cupboard right now: a powdery one with a more pungent/cheesy smell/flavour and a more coarse flake variety (which is less on the cheese but quite earthy). I never know which one to use! Thanks for your insight. i.
I made this soup today for me and my 4 little ones, it was a winner! Even with my son who doesn’t like broccoli! He was pretty surprised when I told him what was in it after he polished of a full bowl! I live in England so I haven’t heard of Whole Foods is it a chain? Sounds like my kinda shop! You’ve done it again, Ange!! I just made a potato and leek soup tonight and then sprinkled some Daiya cheddar on top to let it melt. I kinda ate it in 2 minutes, flat. I think this will be the next soup of choice!! Made this today and it is delicious! Was even able to get all the veggies from local farmers. What a great recipe! I’ll be giving that a go on the weekend. Just a quick question, what do you mean by a sweet onion? In Australia we mainly only have red/Spanish or brown. Also, is nutritional yeast the same as the yeast used for bread/dough making? Made my variation of this soup last Friday (didn’t have quite as many vegetables in the end), but it turned out very well and tasted delicious. I will definitely be making it again with different vegetable combinations each time. Read this recipe last night and couldn’t get it out of my head. Had to use a butternut squash because it’s what I had on hand and….Oh my goodness!!!! This was so delicious! Thanks for another family favorite. I think we’ll be having this a lot this winter. Whole Foods used to be my temple, now it’s buyer beware. I was just so bummed to find out that much of their 365 brand is made in China! That includes their frozen “organic” veggies. So sad. just made this and REALLY enjoying it! (Broccoli is the only vegetable I don’t like but I thankfully can’t detect it in this soup!) I used butternut for the squash, didn’t include the cinnamon and more than doubled the cayenne. A heavy sprinkle of truffle salt really put this over the top for me! Thanks! I’ve been cooking your recent recipes all week and tag you on instagram [email protected] Thanks again!! I’m so excited, I’m making this tonight, except i’m lazy and didn’t buy squash when i went to the grocery store this week, so I’m going to sub a can of pumpkin! Eating some leftovers of this delish soup right now! Love it. Angela, you never let me down girl. Can’t wait for your cookbook! I just finished making a huge batch of this soup and it is amazing! I knew I was going to love it! Thanks so much for sharing it. It is the perfect soup for a fall evening! Just made this tonight. It IS delicious but it came out brown, not the lovely yellow color in your photos? Maybe I cooked the vegetables longer? I am not sure…thank you for the recipe. Hi Angela: I just got done making this soup for dinner tonight, I can’t wait to try it! It is ready and waiting! This soup was fantastic! I made it over the weekend, expecting it to taste like all the other veggie blended soup but KA-POW! This blew my whole family’s taste buds out of the water. Thank you for your incredible recipes and website. Thanks so much for this recipe. I have made it 3 times and eat it some everyday. There is no guilt eating this soup! It is full of goodness. Just made this, and am currently eating it. It is AMAZING! I’m a huge fan of adding the cayenne to give it a real punch. I live in China for work and am always looking for delicious vegan meals that use mostly common ingredients. (Luckily, I bought a massive bin of nutritional yeast online). I’m just wondering if the yeast is needed? Recently released from hospital trying to make something good for body to eat have all items but yeast…what will happen without? I made this a couple of weeks ago, and both my husband and I loved it! Thank you! I have made several other items and it is all good and by the way I did not know veggies could taste this wonderful. I am still embarking on my new lifestyle and dragging my husband with me…he loves everything also. keep it up! This soup was delicious!!! I substituted regular potatoes for the delicata squash due to what I had on hand. I shared this soup with my mother in law, and she said that it was the best soup she has ever had. Also, since my young boys are not huge soup eaters, I had the idea to serve this soup over noodles with a bit of melted cheddar cheese, and “viola!” It was a flavorful mac n “cheese.” I have enjoyed EVERY recipe I have tried from your page. Do you have to peel Delicata squash? Or can the skin stay on? Thanks! I left the skin on – it’s quite thin as far as squash goes and totally edible. Hope this helps! Thanks so much for the reply! I’m going to make it this weekend :) I have never tried delicata squash so I was excited to buy one. I must say that EVERY recipe I have taken from your blog has turned out wonderfully …and I’ve tried a lot of them! Keep up the great work… can’t wait for the cookbook! Did I read correctly that you do not have to peel the delicata squash? Okay- seriously, thank you so much. This is the best thing I’ve ever had!!! It tasted even better left over I thought. I had to use butternut squash- but other than that, I followed your recipe exactly and I love it!! I literally went out and bought 12 new mason jars because I’m gonna need to stock the freezer with this for the winter. We don’t say it enough- thank you for sharing your creative recipes and wisdom with us. I really do appreciate it. You make plant based living much, much tastier! I appreciate you! Hey Susan! yay, so happy you enjoyed the soup! Thanks for your kind words :) Hope your winter is delicious with this soup on hand! Wow, this soup is great! I’m a long-time lurker and a huge fan. I’ve tried dozens of the recipes here, and I’ve never had one that I didn’t love! I made this soup yesterday and added a bit of curry powder at the end. Delicious! Another instant dinner staple. This is your BEST recipe, and I have made, and loved a lot of yours. Super easy and so very tasty…everyone needs to try this one! This is so good! I just found your website and am so happy I did. My meat eating husband had a beef stew, he liked the looks of this so tried it, and stopped eating his beef stew and switched to this! If made it just like the recipe but also added flax seed for a little more protein. My Vitamix did a great job blending it in. I also used raw unsalted pumpkin seeds on top……very good. Thanks! We loooooove this soup! I have made it twice in the last week! Thanks so much! Okay, I’m back again to thank you for this amazing soup. I have now made it 4 times, and each time, I think, I should have made more! ps to my post: I do roast hard root veggies before making soup with them. I use my solar oven for squash (I usually use butternut, but also other types) and sweet potatoes. Also, onions are better cooked first as they tend to be a bit sharp if added to the Vitamix in the raw state, even though they are liquefied and not identifiable except by smell and taste. Just wondering if you have the nutritional info for this recipe? I know you have included in the past but can’t find it now? I made this last night for a healthy kick start to 2014 – I used butternut squash as that was all I could find. It was delicious! Sadly my Vitamix wasn’t with me so I just used a stick blender, it worked fine though I am sure Vitamix would have resulted in a more creamy soup. Thanks! I am slowly sneaking vegan food into my family’s stomachs and so far they have not seemed to notice. But! I have never used nutritional yeast. I bought some but am reluctant to try it. Is this an acquired taste? Will this flavor stand out in the soup? Can’t decide if I should just go for it or use half and work my way up or leave it out? A ridiculously fantastic recipe. I’ve made it three times in two weeks! The whole is definitely greater than the apparent sum of the parts here. Almost no oil, minimally spiced, and yet it is addictively delicious with an amazingly rich texture. You have struck absolute gold here… or, you are at least brilliantly imitating it! Nice work… and big thanks. We made this for a dinner party last night and it was loved by all. One of the guests just emailed me for the recipe. We skipped the cinnamon and used the cayenne. It was so good! I made this the other night and it was SO SO good! I’m not vegan, so I added some chopped up chicken breast to it for a protein kick and to make it a meal soup, and because it makes so much my husband and I have been enjoying it for days! On the broccoli and used a sweet almond milk to thin it a little… It was a hit at my house! Next time I will pull some out to be cayenne free for my daughter..two thumbs up! Thank you! Made this for my family and I last night. Followed the recipe exactly, except for the squash. I only had butternut so I substituted it. It was AMAZING!!!!!! Even my 7 and 2 year olds had two bowls. Thanks so much for the wonderful recipes!! Ang, I have had this soup bookmarked for AGES. I knew my Vitamix purchase was finally in the near future and I wanted this to be my first soup! I’ve just finally made the splurge on a vitamix this weekend and this was my first recipe. It was delicious, creamy and came out perfectly smooth. Next up is to tackle a green monster in the morning! Just made this tonight! A delicious warming soup for a cold damp evening! I’ll be making it again for sure! This soup is amazing. I find when you use the vitamix and pulverize it that is has a very creamy texture. The spices make this recipe. A lot of work but worth it. I replaced the Delicata Squash with Zucchini and it came out great! Added some extra cayenne and cinnamon as well. Love this soup. I have made it once and am preparing a batch again today. I’m not a fan of butternut squash soup, but this one has so much more going on, especially with the added ‘cheese’ I am preparing a double batch today and will freeze the extra in mason jars. thank you Angela for another great recipe! Wow! I just made this soup for the 1st time (literally eating some now), and I am in love. Typically I prefer big, robust veggie stews and soups because I love to sink my teeth into the tender veggies so I can taste each one. However, making this soup was so much fun for me and I’m not even missing chunky vegetables to bite into. This is very filling, and yes the flavor of each vegetable is still prominent and extremely satisfying! I have enjoyed many of your recipes, but this one will stand as my favorite…for now! This is the most amazing soup I have ever tasted! I used butternut squash because it was all my grocery store had, and I omitted the cinnamon – instead I sprinkled a little smoked paprika on top just before eating. Perfection. I love knowing that I’m getting so many servings of veggies in one delicious meal. I love your recipes because you really know how to showcase how amazing and delicious veggies are! Thank you!! This soup is definitely going to be a regular in our house. This was delicious. I didn’t have any celery on hand, so I added a teaspoon or two of Herbamare seasoning, which gave it a subtle celery flavor. I went light on the cayenne (I am very sensitive to spiciness!) and it came out PERFECT! Thanks for sharing!! Lovely and it was so smooth and creamy, I will be making this one again. Hi Angela, I was just came across this wonderful coloured soup and have been inspired to make it! I was wondering if the nutritional yeast needs to be powdered or flaked? I’ve never used it before and don’t want to get it wrong! :) Thanks x PS love your blog, can’t get enough of it! I think either should work :) You can always add it to taste too…the powdered might be slightly more concentrated. This looks great! What kind of blender do you (or other commenters) use? I have a basic one-speed Ninja that my husband uses to make shakes and a Kitchenaid immersion blender, but i always seem to have trouble getting pureed or cream-style soups to actually come out smooth. It always seems like, well, very small vegetable particles suspended in liquid, ha. I’d love to improve the consistency without dropping $500 on a Vitamix (I just won’t go there). Any suggestions? Only the best soup ever! Think this might be my favourite soup of all time. Great recipe! I’ve made it several time and really love it. I know this post is old, but I wanted to share one of my favorite vegetable broth tricks as I also got tired of paying for expensive vegetable both. I save all of my vegetable scraps (carrot tops, broccoli stems, onion bottoms, etc.) in a plastic bag kept either in my fridge or freezer (depending on how soon I think I can fill it. When the bag is full I add some garlic cloves, and a bay leaf and use it to make a big batch of broth. I freeze whatever I can’t use right away and voila – practically free broth! Its also fun because the broth will have a slightly different flavor based on what veggies you put in. I have embarked on the Standard Process Purification diet and your website is a godsend. I made the 7 veggie soup tonight and oh my it was deelish! My 7 and 10 year old boys even devoured it! I am excited to try more of your recipes. Dutch Oven and Vitamix ! This soup is amazing. I used acorn squash and sunflower seeds. I cannot believe how good it tastes! Thank you!!! I subbed potatoes for squash since that’s what I had. 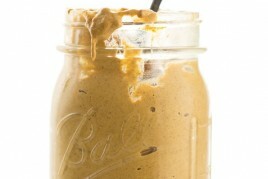 Pureed only half for a creamy-chunky texture. Was really good. I’m not vegan but didn’t miss the cheese here. My one-year-old ate it up too, so that’s a plus. This was fantastic! I added a little more broccoli and some cayenne as suggested. Sooo tasty. I can easily see this becoming one of my favorite soups. And I love that it makes so much, so on my lazy days I can still enjoy something fast and filling. Next time I may try it with some cashew cream added in for an even more “cheesy” taste. This soup is absolutely delicious! I have been vegetarian for two years and slowly making my way to Vegan ( still love my cheese). I cook a lot of your recipes. Thanks for continuing to make great recipes! I am stuck with soup after getting my wisdom teeth pulled and this soup is saving me! It is so delicious; love the combination if the cayenne and cinnamon! Your description of pureeing the soup in a blender took me back to the slow and messy days before I got my immersion blender. Now I can puree soups in the pot! While they’re hot! They’re under $50 and so useful! I just made this soup and, like all your other recipes I’ve tried, it’s fabulous! Thank you for all your great recipes! I thought what you said about Martha Stewart in your cookbook was just plain mean..!!! She paid the price and spent her time in jail .I guess you don’t believe in rehabilitation. I have everything I need to make this awesome-looking soup, but I’m curious whether you peeled your delicata squash. I will definitely be trying out this recipe. It looks so healthy and creamy. Plus all the vegetables used are extremely good for you. One tip, try adding a bit of chilli whilst blending, it will give the soup a bit of a kick. If you u like things spicy of course. In addition to being delicious, this is about the easiest soup to make ever. One cutting board, one pot, most measurements are one… one onion, one head of broccoli, one squash… I read the recipe once and was nearly able to do without referring to it. That makes this an all around winner! I really hate it that the pictures don’t print with the recipe. Can you fix this? Can anyone advise whether they used powdered or flaked nutritional yeast? I have never used it but I believe you use less if it’s powdered, so don’t want to overdo it! Soup recipe looks terrific. Hi Kia, I use flaked nutritional yeast, but only because that’s all my grocery stores seem to offer. I don’t think I’ve seen the powdered nutritional yeast before. I do think they’d be interchangeable in recipes, though. If you try the soup, I hope you enjoy it! I am new to the vegan world and your recipes have made the transition a breeze!! I’m so happy I found your book. It’s my bible for vegan cooking lol This soup is really good ;-) By any chance, do you have a recipe somewhere on your site for a split pea soup? It’s one of my favorites and I’m creative enough to throw it together. Thanks! And good luck with everything! Looks delicious. Is there a good tasting nutritional yeast brand you can recommend? I haven’t been happy with the few I’ve tried. Hi Jacquie, I’m not sure if there’s a particular brand that I recommend, really, but I use “Purely Bulk” brand because that’s what my grocer carries. :) Hope this helps! Hi, Did you alter this recipe lately? I feel like I remembered reading about cinnamon in the recipe or description when I made this soup the first time a month or two ago, but now, although I find references to cinnamon in the comments section, it’s no longer in the description or the recipe. Am I going crazy, or was it in this recipe before? I think it’s better with the cinnamon. Yes, the recipe has been slightly modified in recent weeks, however feel free to add a bit of cinnamon if you like! Late to the party as I just discovered this recipe on the app today, but whoa this an amazing soup! Easy to prep and quick to make. I used 8 tbsp nutritional yeast as I love the flavor and butternut instead of the delicata squash. The soup was creamy and filling. My broccoli-averse, meat and cheese loving Dad went back for seconds and kept commenting on how much he loved it! Thanks for making a family dinner healthy and satisfying! I love your new connection to us!!! I would like to know what kind of vegetable broth you use. I have not found one that has a very good taste so I continue using chicken broth. Does Whole Foods have one you would recommend? Thanks for all the time and love you devote to your blog!! Hi Barbara, I use Imagine Organic Low-Sodium vegetable broth. If you give it a try, I hope you like it! Just made this soup last night, and it was delicious! I halved the recipe, left out the squash because I didn’t have any, and used regular white vinegar instead of wine vinegar. The result was fabulous! It’s definitely one of my favourite OSG soups… perhaps second only to the roasted tomato & coconut soup. I’ve been on a real blended soup kick since getting my wonderful Vitamix for Christmas! Thanks for another great recipe, Angela! I have recently discovered frozen butternut squash and it is such a time saver! Delicious soup, I have tried it and I love it. So healthy too!! I had to comment about how perfect this soup is. The only change I made was using a butternut squash instead of the delicata squash as they don’t sell them here. I find the balance of flavours spot on. It tastes really good with or without the nutritional yeast too and I just add it in on the day depending on how I’m feeling. Wonderful recipe! I recently spent a few days with my dad, who is terminally ill with cancer, and hasn’t much appetite – except for soup! I made soup four nights in a row for our dinner, and this one was just fantastic – a bit spicy, but so rich and flavorful! I didn’t have the squash, but it was still amazing. He and my mom were surprised it was vegan and even loved the nooch! Thanks for a heart-and-belly warming recipe, I will keep this one! Made this tonight and it is DELICIOUS!! This soup is A-MAZING ! Thank you for sharing such a wonderful, healthy vegan meal. When my husband and I were making this soup the other night, he asked what the reviews said about it. I replied, “I never read the reviews on Oh She Glows; every recipe is delicious.” And this soup is no exception. So easy, so healthy and so perfect for this week’s polar vortex in the Midwest. Only change I would make for the next time (and there will be next times) is to not do the cayenne. I like heat but for some reason, the cayenne isn’t blending well with the rest of the flavors for me. I’m also 34 weeks pregnant so probably overly-sensitive to spice. Also, this is the first time I’ve experienced nutritional yeast. My mind is kind of blown by it. Thank you, Angela, for another delicious and healthy recipe! I’m glad you enjoyed the recipe, Ann, and thanks so much for the sweet words! :) Best wishes to you and your growing family! Where do you get your nutritional yeast from? i can’t wait to try your recipes!! Hi, Shannon. I personally get my nutritional yeast from Organic Garage, but you may be able to find it in your local Bulk Barn or in the organic/natural foods section of your local grocery store. Hope this helps, and happy cooking! This looks great and I’m planning to make it tomorrow. Have you ever added beans or lentils, or maybe even a soft tofu, to increase the protein? I don’t want to mess with the flavour of the soup so I’m wondering if you have a recommendation. Thanks in advance! Hey Jocelyn, Oh that’s a great question…I’ve wondered the same but haven’t had a chance to try it out yet. I definitely think you’d be able to add roasted chickpeas on top…spiced with your fave spices would be delicious and wouldn’t impact the soup’s flavour. If you try adding anything to the puree I’d love to hear how it goes. Will it make a difference if not using the nutritional yeast? It won’t taste as cheesy, but you can absolutely leave it out and adjust the other flavours to your liking. In fact, I just did this this week! Still very tasty. Hi Angela – I made this soup over the weekend to freeze for work lunches. When it was first done, I wasn’t sure I was all that crazy about it…felt like it was a bit of a “meh”. But pulled out a container for lunch today and really loved it. Now I’m thrilled it made so many servings. And I feel great about how healthy this is. One question – the recipe seems to call for just the broccoli florets…do you not recommend using the stalks, too? Thanks for all your great recipes! Hi Karen, Oh I’m so glad you enjoyed it so much after the flavours hung out for a while. ;) I find that true with this soup (and many others) too. To be honest, I haven’t tried this using the stalks as well as the florets. I was worried that they may overpower the other flavours, but I’m really not sure. If you attempt anything I would love to hear what you think! Previous post: What Did U Do?